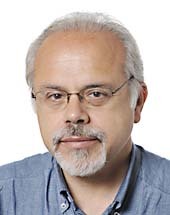 Michalis Tremopoulos is a journalist, author and lawyer, holding a Master's degree in Social Ecology (USA). He was born in Serres in 1958, but since the age of 3 he lives in Thessaloniki. Since 1998 he is an elected prefectural advisor in Thessaloniki. He is a founding member of GreenEcologist, member of the Pan-Hellenic Council and he was at the head of the ballot in the European Elections. He has been brought into courts (but never convicted) for his fights against the deforestation for urbanization purposes (Sheikh – Sou, Hortiatis, Porto Karras, Sanni etc.) and his support for collective interest. Μichalis Τremopoulos has began to mark an important presence in the European Parliament. After being proposed by the European Greens and following his unanimous acceptance, he was elected as the Vice-President of the important Committee on Regional Development. At the same time, he participates as a substitute member in the Committee on Environment, Public Health and Food Safety as well asin the Delegation for the Western Balkans. In addition, he participates in the coordination group which consists of the representatives of all the parliamentary groups of Greens and which comprises of one representative for each country.